There are many types of intersections in the Netherlands. In an inherently safe road traffic system, however, the number of intersection types needs to be limited, depending on the road types that intersect. The desired types of intersections do not always correspond with the recommendations in the design manuals. The conflicts and the differences in mass and speed determine that may occur determine which type of intersections is required. Where conflicts are unavoidable, it is important to limit their severity by reducing speed. At a speed limit of 30 km/h, slow and up to 50 km/h fast traffic may intersect; at higher speeds this is no longer desirable. Uniformity of intersection types will increase their recognizability for road users and is more likely to elicit the desired style of driving. Of all registered road traffic casualties (fatalities and serious road injuries), 44% occur at intersections; three quarters of which are urban crashes. This factsheet discusses the different types of intersections in the Netherlands, both in rural and in urban areas. The road safety of these intersection types is examined in different ways: a comparison of intersection types and by exploring the factors that can make intersections (inherently) safe. The focus will mainly be on intersections between access roads and distributor roads, intersections between two access roads and intersections between two distributor roads. Roundabouts, intersections between through-roads and distributor roads and intersections between two through roads are not discussed in depth. More information about roundabouts can be found in SWOV Fact sheet Roundabouts. More information about access roads, distributor roads and through roads is presented in the archived SWOV Fact sheet entitled Background of the five Sustainable Safety principles. How safe are the different types of intersections? The (lack of) safety or risk of an intersection is generally expressed in the number of crashes per number of crossing vehicles (volume). intersections without cycling facilities compared with intersections with a separate bicycle path. The last finding seems to be counterintuitive. However, research has been conducted into the main features of roundabouts only, without looking at the other features of the intersections. Some intersections, for example, require bicycle facilities, whereas other intersections do not. Nor was account taken of the structure and function of the road network the intersections were part of. Therefore, the Janssen study cannot and should not be used to convert ‘unsafe’ intersection types into intersections with a ‘safer’ rating. Only before-and-after studies can establish whether a change in the situation has actually improved road safety. 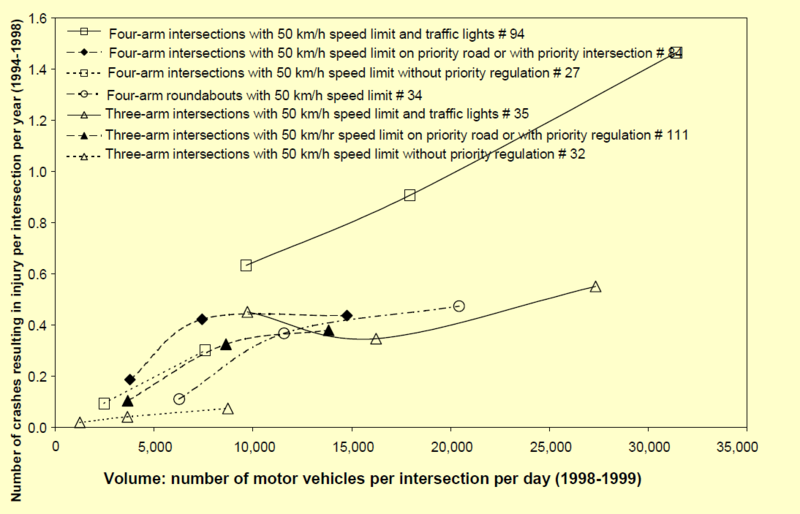 Jansen (2004) also examined the relationship between injury crashes and traffic volumes at intersections of through-roads with a 50 km/h speed limit. Figure 1 shows that the number of injury crashes usually increases with increasing traffic volume; the exact relationship differs for different types of three-arm and four-arm intersections. Figure 1. Relationship between number of injury crashes and traffic volume on three and four-arm intersections of urban through-roads with a 50 km/h speed limit. The # sign indicates the number of studied intersections of that particular type (Janssen, 2004). Beenker (2004) carried out a before-and-after study into the layout of 60 km/h zones. The study showed that the number of casualty crashes at intersections in these zones had decreased by 47% compared with the situation before the 60 km/h layout was introduced. A comparative study at network level showed that roundabouts and staggered intersections are safer than four-arm intersections (Hummel, 2001). A staggered intersection is a four-arm intersection which is divided into two three-arm intersections. This prevents serious transverse conflicts. Hummel based his research on data from the United States and several European countries. An Australian before-and-after study by Corben et al. (2007) showed that the construction of staggered intersections resulted in a 93% decline in the number of serious crashes. However, according to Corben et al. staggered intersections do not entirely fit into a safe traffic system because they are not sufficiently forgiving in the case of driver errors, particularly in situations with high speed limits. While transverse conflicts are avoided, other potential conflicts remain. In Finland the safety of three-arm and four-arm intersections in rural areas was investigated in a before-and-after study (Kulmala, 1995). This showed that 1.3 to 1.4 times more crashes occur on four-arm intersections than on three-arm intersections. Other international studies (including comparative studies) also showed that four-arm intersections are less safe than three-arm intersections and that roundabouts are safer than 'ordinary' intersections (Elvik & Vaa, 2004; O’Cinneide & Troutbeck, 1995). What makes an intersection (inherently) safe? Figure 2. Conflict points on a roundabout, three-arm intersection and four-arm intersection. When conflicts can occur, it is important to reduce their severity by setting a safe speed limit. Table 1 shows the safe speed limits for encounters between certain types of road users. It can be seen, for example, that 30 km/h is the safe speed limit for encounters between different types of road users. Table 1. Proposal for safe speed speed limits for cars, given possible conflicts between certain types of road users (Tingvall & Haworth (1999) in Wegman & Aarts (2006). Safe speeds can be brought about by setting a safe speed limit and by infrastructural measures. At intersections physical speed-reducing measures such as roundabouts, speed humps and raised intersections can be used. Furthermore, the desired driving speed can be evoked by consistency and continuity in road design. This will ensure that road users recognize the types of roads and intersections and know what they are expected to do (Wegman & Aarts, 2006). For more information about speed management see te archived SWOV Fact sheet Measures for speed management. More about recognizability can be found in SWOV Fact sheet Predictability by recognizable road design (archived). Which recommendations are there for different types of intersection? In the Netherlands, CROW has drawn up recommendations about which type of intersection should be used under what circumstances. For urban situations these recommendations have been published in the publication called ASVV (CROW, 2012). Recommendations for rural intersections can be found in the publication Handbook for Road Design (CROW, 2013). The recommendations are no official guidelines. Table 2 summarizes the recommendations for intersection types in the CROW publications. Table 2. Recommendations for urban (ASVV, CROW 2012) and rural (Handbook for Road Design, CROW 2013) intersection types. At urban intersections, raised junctions can be used as an awareness-raising measure for intersections between access roads. At a rural priority intersection between an access road and a distributor road, the distributor road is the priority road. In rural areas intersections should be avoided as much as possible regarding 1 x 2 lanes access roads and 2 x 2 lanes distributor roads. As the pass speed should preferably be no higher than 50 km/h, speed reduction measures are required at intersections of distributor roads. When a roundabout is one of the recommended options, it is the best option, both in urban and in rural areas. In practice there are several implementation variations of intersection types. This can be caused by the traffic situation, costs or by the available space. Because there are no formal guidelines for intersections, the uniformity of intersections is not guaranteed. CROW is currently working on the publication on basic characteristics of intersections that is to be published in 2015. In this context, SWOV published the report Several aspects of intersection safety (Dijkstra, 2014a; 2014b). When and how are traffic signals applied at intersections? For certain intersections and roundabouts, the choice is made to use traffic signals to manage the traffic. Three criteria are used to determine whether or not traffic signals need to be installed (CROW, 2006): traffic volume, time loss and safety in numbers of crashes. Well-designed traffic management results in efficient time distribution among road users and can, for instance, give priority to public transport (CROW, 2006). Traffic signals use time to separate traffic; they take care that, for example, the two conflicting directions at an intersection do not get a green or amber signal simultaneously. Furthermore, the time lapse between the end of the amber signal for the one direction and the start of the green signal for the other direction must be sufficiently long (CROW, 2006) . Table 3. Different types of traffic signal. 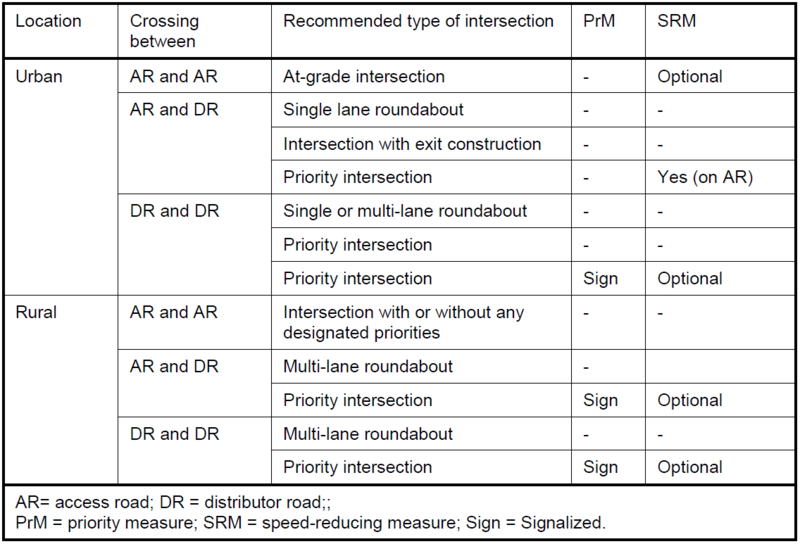 There are several types of traffic signal, see Table 3. The most suitable type is determined by the traffic situation. In general, traffic signals do not improve road safety (Ogden (1996) in Hummel, 2001). This is due to the fact that the traffic is not separated location-wise but time-wise, which means that red light violations can still result in crashes. Because in those cases speeds are often high, this leads to serious conflicts. Rear-end collisions can also occur when a driver continues at the same speed while the vehicle in front slows down (Kennedy & Sexton, 2009). There are different possibilities to handle slow traffic when traffic signals are used a VRI. Non-conflicting bicycles in parallel directions can get green at the same time as motorized traffic. It is also possible to give all cyclists the green light simultaneously, while the other traffic has to wait for red (CROW, 2006). The safety effects of the different methods are unknown. Which type of intersection is to be preferred? The roundabout is preferred above ' normal ' intersections, because not only does the roundabout have fewer conflict points, it also has a lower passing speed. The consequences of any conflict are therefore less severe. Intersections are preferably not regulated by traffic signals; high speeds can lead to very serious conflicts in case of red light negation. Different types of road user can be found on distributor roads, for example motor vehicles and pedestrians/cyclists. These differ considerably in mass and, speed differences will therefore need to be minimized at (at-grade) intersections. This is also the case for access roads. For information about facilities for cyclists and pedestrians we refer to the (archived) SWOV Fact sheets Crossing facilities for cyclists and pedestrians and Bicycle facilities on road segments and intersections of distributor roads. There are numerous types of intersections in the Netherlands. In an inherently safe road traffic, however, a limited number of intersection types for intersections between different road types is preferable. These preferred intersection types sometimes differ from the recommendations in the Dutch design manuals. Inherently safe intersection types make allowance for safe speeds to avoid serious conflicts, transverse conflicts and frontal conflicts, or to reduce the severity of the consequences. At a 30 km/h speed limit, slow traffic and fast traffic can be allowed to mix. At higher speeds, this is no longer permissible. When the choice is between the construction of an intersection or a roundabout, the roundabout is preferred for security reasons. Intersections are preferably not regulated by traffic signals; high driving speed can result in very serious conflicts in the case of red light negation. Uniformity of intersection types is important in order to make them recognizable and predictable for road users and thus encourage the desired traffic behaviour. Wegman, F. & Aarts, L. (eds.) (2006). Advancing Sustainable Safety; National Road Safety Outlook for 2005-2020. SWOV, Leidschendam. SWOV (2014). Types of intersections. SWOV Fact sheet, November 2014. SWOV, The Hague.